The complete system for the perfect espresso: the exclusively-designed Trè machine and Èspresso1882 capsules with intense aroma. Trè Machine + 10 packets of 50 capsules + 2 kits (500 plastic cups, 500 sachets of sugar and 500 coffee stirrers). 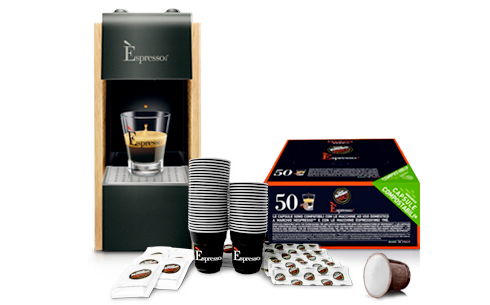 60 Packets of Èspresso1882 (12 Cremoso, 12 Arabica, 12 Intenso, 12 Lungo Intenso, 12 Decaf) + white oak Trè machine. 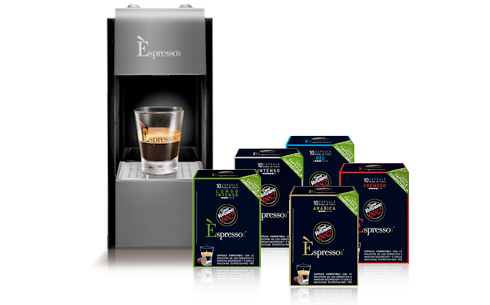 60 Packets of Èspresso1882 (12 Cremoso, 12 Arabica, 12 Intenso, 12 Lungo Intenso, 12 Decaf) + black oak Trè machine. 60 Packets of Èspresso1882 (12 Cremoso, 12 Arabica, 12 Intenso, 12 Lungo Intenso, 12 Decaf) + natural oak Trè machine. 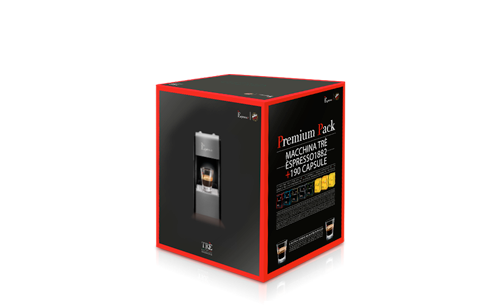 1 Oak Trè Machine + 13 packets of Èspresso1882 (3 Cremoso, 3 Intenso, 3 Arabica, 2 Lungo Intenso, 2 Decaf) + 6 packets of Thèspresso (2 English Breakfast, 2 Earl Grey, 2 Lemon). 1 White Trè Machine + 13 packets of Èspresso1882 (3 Cremoso, 3 Intenso, 3 Arabica, 2 Lungo Intenso, 2 Decaf) + 6 packets of Thèspresso (2 English Breakfast, 2 Earl Grey, 2 Lemon). 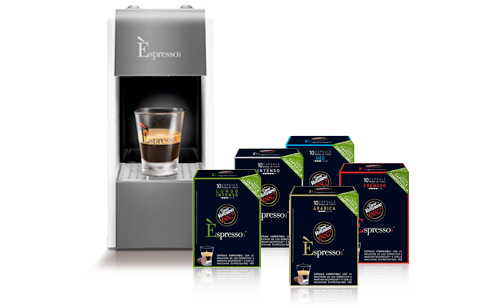 1 Black Trè Machine + 13 packets of Èspresso1882 (3 Cremoso, 3 Intenso, 3 Arabica, 2 Lungo Intenso, 2 Decaf) + 6 packets of Thèspresso (2 English Breakfast, 2 Earl Grey, 2 Lemon).